The REGI staff knows when spring has truly arrived because we start receiving all the colorful songbirds. 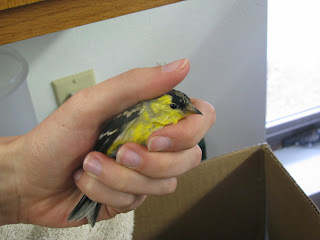 A few weeks ago we were receiving nothing but Pine Siskin. 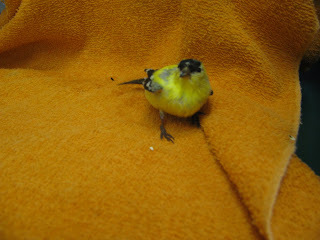 This week besides all the Bald Eagles, we have admitted 3 Gold Finches into our care as well. The two males we received are doing well. The female is in rough shape but we are keeping our hopes up. All three birds were brought in by people who took the time to notice and care that some of their bird feeder visitors were having a rough time in this cold rain and snow we have been having. One of the males has his wing taped to help him heal a broken wing. The other male has a slight injury to his right foot. Nothing some time and tender loving care won't heal! 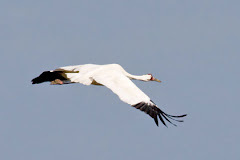 When the spring weather finally catches up to us they will be moved into our songbird flight area. REGI cares for all bird no matter how small because they are all have important roles in nature.